Tipping points occur when small shifts in human pressures or environmental conditions bring about large, sometimes abrupt changes in a system – whether in a human society, a physical system, an ecosystem, or our planet’s climate. More and more examples of tipping points in ecosystems around the world are raising concern among scientists and policymakers. In the oceans, diverse ecosystems ranging from reefs to estuaries to pelagic systems have undergone sudden, dramatic shifts. Changes in ocean climate, the abundance of key species, nutrients and other factors drive these shifts, with resulting effects on ocean food webs, habitats and ecosystem functions that have direct impacts on people’s livelihoods and well-being. Ocean tipping points are cause for concern because they are hard to anticipate and can be very difficult, if not impossible, to reverse. Why should I care about tipping points? For managers of marine ecosystems, it is critical to identify, understand, and predict ocean tipping points because they change the rules of the game. The new ecosystem state may function quite differently from the previous one, respond differently to management interventions, and provide different levels and types of benefits than people are used to or need. Although there have been many critical advances in the science of tipping points in recent years, managers still lack practical tools and information to help them anticipate and respond to these dynamic changes. 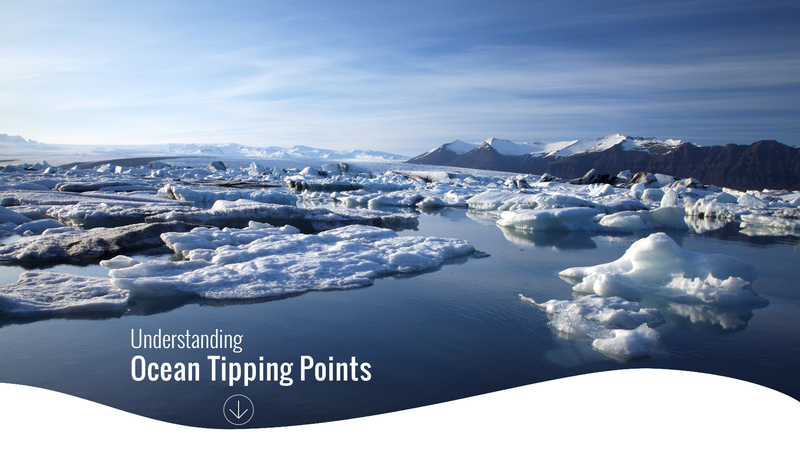 How can ocean tipping points science help you meet management objectives? From examination of 51 case studies from around the world, we know that this thresholds-based approach to management tends to lead to better ecological outcomes. Luckily, applying a tipping point lens to your work does not have to mean re-inventing the wheel. In fact our analysis shows that all of the major US environmental laws already require, or provide scope for, the use of thresholds and other tipping point concepts. Social and ecological tipping points are common in marine ecosystems, allowing us to derive core management principles that are broadly applicable to these systems. The potential for tipping points to profoundly affect the way a system works, as well as the benefits it delivers to people, puts a premium on quantifying critical thresholds and identifying early warning signs of impending change. Armed with this knowledge, managers can establish a precautionary buffer and identify management targets to stay sufficiently far away from an undesirable tipping point. The area outside of that buffer zone is the “safe operating space” for decision-making, within which decision-makers have options about what actions to take. The figure below illustrates what a precautionary buffer zone and management targets might look like in the case of kelp forest and sea otter management. The figure also links the specific ecological observations of this system with the broader tipping points principles of management that have been derived from the Ocean Tipping Points project. Marine management decisions are embedded in and reverberate through an interacting ecosystem of linked human and ecological communities. Growing recognition of the importance of those interconnections in recent years has spurred efforts to understand social-ecological linkages, consider cumulative impacts and develop ecosystem-based management approaches. Throughout this site, we’ll demonstrate how tipping points science supports and enhances this ongoing shift toward more holistic management. We will show you where the insertion points are for this science in existing law and policy. And we will provide tools and resources to get you started in applying this thinking in your own system.